← WHAT PHONY NAME SHOULD WE USE FOR THIS SCANDAL MR. PRESIDENT? 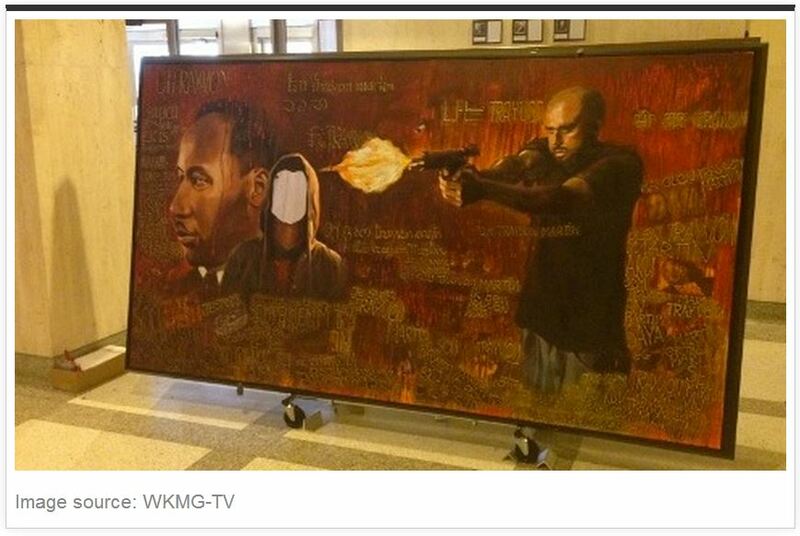 Some Miami lying “artist” and apparently seasoned protester named Ms. Houng displayed her outrageous depiction of the shooting of Trayvon Martin as a cold blooded assassination. Ms. Huong titled her lying trash, “We Are All Trayvon Martin.” It features a mirror so viewers can see themselves. It also has a likeness of Martin Luther King Jr., with blood running down his head. No Ms. Huong, we are not all Trayvon Martin. To the degree we can identify with your sick message, we are insane. 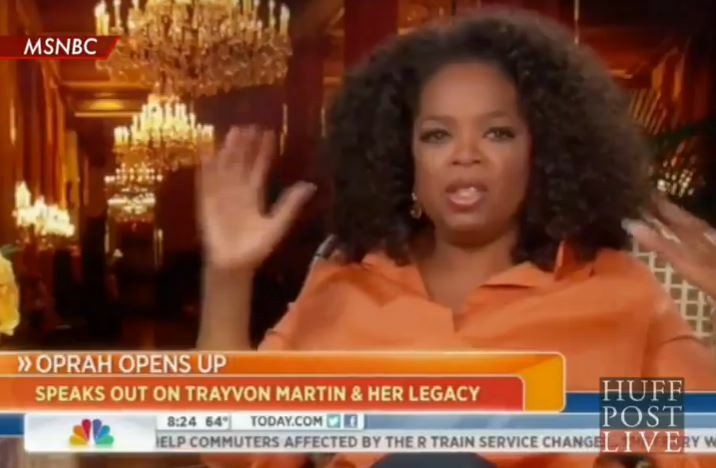 In a brief clip that aired on Monday’s “Today,” Oprah Winfrey compared the killing of Trayvon Martin to that of Emmett Till, the young black boy whose brutal murder helped fuel the civil rights movement. 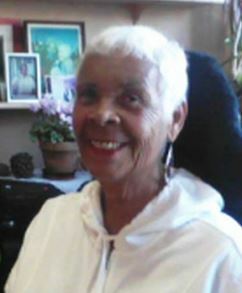 It was one of her first public comments about the case, which has seen African Americans and whites sharply divided about whether George Zimmerman’s acquittal was just. The long-awaited verdict in the Zimmerman trial was incredible – “not guilty.” Listening carefully to the trial judge’s detailed instructions to the six-juror panel (amazing in itself), including complete definitions of second degree murder and manslaughter, I was convinced that were they to follow her instructions, the verdict was bound to be guilty as charged or at least the lesser charge of manslaughter. After over 12 hours of deliberations, my worst-case scenario was a hung jury. Yet how could I forget that this trial took place in a judicial system I’ve long known (through experience!) represents white-supremacist injustice and in one of the most racist states in the country – Florida, the nation’s second highest incarcerator and state executioner of Black men. Off the top, how many other cases come to mind of a young Black man senselessly murdered by so-called law enforcers? Oscar Grant, Alan Blueford, Kenneth Harding, Amadou Diallo. In fact, a Black person is murdered by law enforcement every 28 hours. Are their lives valued? An endangered, stereotyped group, Black and Brown male human beings top the prison populations and those slated for state murder. Black women and mothers are swiftly gaining a similar fate as more and more Black babies are literally born in prison. You can’t even imagine a reverse situation playing out the same way: A Black self-appointed neighborhood patroller with a loaded firearm follows a young White man, presumptively calling him a “f++king punk,” and after a scuffle, the unarmed White teenager is dead from a fatal shot to the heart. No arrest of the Black perpetrator is made for well over a month, or until White people take to the streets and raise hell. Now that’s really hard to imagine. That the lawyer defenders of the murderer wanted jurors they could count on to render an acquittal meant they had to pick individuals they thought would devalue the life of a young Black man, just as the general society or U.S. population devalues Black life. As a Black mother who raised a Black son, I readily empathize with Trayvon Martin’s mother and father. They have my deepest sympathies and condolences in this tragic loss and travesty of justice. I would urge them to turn grief into strength and find peaceful, insightful means to fight for real change in honor of their child. My son was born on Jan. 21, 1960, and, politically naïve, I thought his birth on Inauguration Day was a sign that he was going to be the first Black president. How ironic. As I began noticing society’s regard of my dark-skinned, curly-headed baby boy, I grew conscious that it was nothing like my viewpoint. I thought he was gorgeous. Racism in the schools plus police brutality and murders of Black folks in the 1960s – culminating in the blatant murder of Black Panther leader Fred Hampton in 1969 – made me politically conscious. I joined the Black Panther Party and decided to take my son out of public school to home-school him. When he was 13, I so feared for his life, I gave him martial arts lessons and allowed him to devote full time to the art of self-defense. Eventually, he earned a 4th degree black belt in Choy Li Fut. To date, he’s never been beaten or arrested. The media blitz over Trayvon Martin and George Zimmerman has been in-depth, saturating mainstream news for days before, during and now after the trial – commenting on every aspect of this case, with sympathy clearly on the side of Zimmerman. It has completely obscured the current hunger strike by tens of thousands of California prisoners protesting prolonged solitary confinement. Martin, who was shot 21 days before his 17th birthday, is always said to be 17 – perhaps to make him a bit more ominous – and every attempt has been made to assassinate the character of this teenager. It brings to mind one very courageous 17-year-old Black manchild, our martyred hero Jonathan Jackson, about whom you’ll rarely hear a word. Jonathan stormed the courtroom of Marin County, Calif., Aug. 7, 1970, armed to the teeth, where the trial of captive freedom fighter, James McClain, was providing real-life lessons on criminal injustice masquerading as equal justice. Attempting to expose racist prison hell and free the Soledad Brothers, including his older brother, George, Jonathan was shot dead before he could drive the van out of the parking lot. “McClain wanted to use his trial as a demonstration of this thing that people are slowly becoming aware of – that the court process, the legal process is just a farce, a device to keep us thinking in conventional terms that perhaps we can get some relief in conventional ways, established ways. He wanted to use it as an example [author emphasis] …. They killed George Jackson, but they couldn’t kill his spirit, his ideology, his lasting legacy of courageous, international organizing. He is so feared by prison officials that just having his name on a piece of paper can get a mainliner thrown into the hole indefinitely. And they say we have no power. Let us please not allow the opportunists of the so-called Left or Right exploit this travesty to further divide us. We must not let this teachable moment escape again. The system will not collapse on its own. Our Mao noted, “If you don’t hit it, it won’t fall.” And I’m not meaning that literally. We cannot use now the military tactics we once espoused in our self-defense over 40 years ago. We’d be giving our enemies the opportunity to simply escalate mass genocide, which they’re already doing in Africa and Asia. George Jackson is so feared by prison officials that just having his name on a piece of paper can get a mainliner thrown into the hole indefinitely. And they say we have no power. Let’s do take Jackson’s advice and STOP using these racist courts to solve our problems. Stop expecting justice from white-supremacist-controlled courts. The latest Supreme Court decisions rolling back our civil rights to vote, giving corporations unlimited power, etc., should have convinced us by now that there’s no justice, just us. Millions of Trayvon Martins are trapped behind bars in either overcrowded, three- to four-bunk-bed gymnasiums or caged in solitary confinement in windowless cells endlessly. Stop expecting justice from white-supremacist-controlled courts. On July 8, 30,000 prisoners refused meals as the promised hunger strike began. It continues as I write this on July 14. No doubt the numbers are reduced as time goes by and suffering increases. What’s especially encouraging about this collective cooperation and nonviolent action is the coming together in recognition that there’s one human race and we’re all in it together, that an injury to one is an injury to all. That if we continue to allow the divide-and-rule strategies of our foes to keep us polarized – as they’re doing right now in the wake of the Zimmerman acquittal – we will only continue to see the clock turned backwards by the tiny fraction of the 1 percent that’s running the whole empire. Join the resistance, support the resisters, the hunger strikers, in every way possible, and organize, organize, organize. We must throw our collective weight into stopping this rotten system in its tracks. We can say NO! again and again in a myriad of ways. And we can say YES! to changing ourselves and our politics. That involves first recognizing our own brain-washing and moving to become the new, nonracist, nonsexist, nonjudgmental human beings who believe in ongoing growth and development, mental, physical, emotional. Understanding that we are all connected, we must nurture our collectivity through cooperative activities and attitudes. Finally, have faith in the people (of the whole world) who in the final analysis will make the revolution. The overwhelming majority of the world’s peoples are being dominated, exploited, incarcerated, tortured and oppressed by the tiny international oligarchy that comprises the global owners. But the wheels of industry cannot turn without us. The overwhelming majority of the world’s peoples are being dominated, exploited, incarcerated, tortured and oppressed by the tiny international oligarchy that comprises the global owners. We’re talking billionaires and trillionaires at this point in history. But the wheels of industry cannot turn without us. To those who have read this far and find themselves in complete disagreement with what you just read and therefore are arguably sane, need to understand the insanity that has been loosed on America these past five years of divide and destroy by race. The road ahead will be troubled. 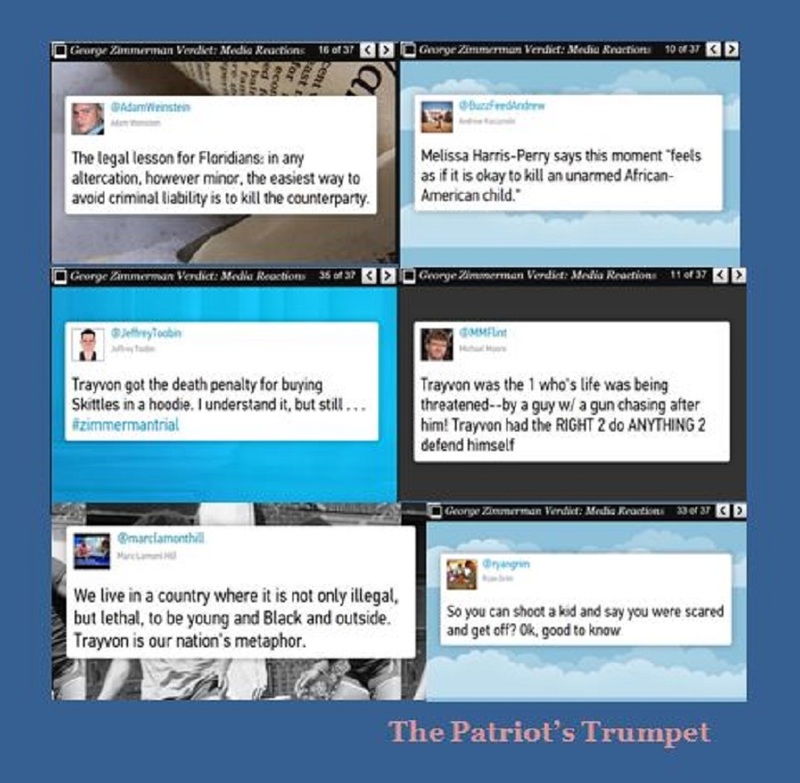 This entry was posted in Obama's America: Racism. Bookmark the permalink.